Dalmatian Greeting Card – Black & White with a Splash of Colour! It’s been a while since I created a new design so I thought I would share how I created this fun dalmatian greeting card with you. I love images that are black and white with a little splash of colour and have created a few of them in the past myself. As soon as I saw the original photo of this dalmatian with it’s tongue out I just knew I wanted to make the whole image black and white except the tongue. Now there are a few ways in which you can do this, but I’m just going to show you the super easy way and all you need is photoshop! As you can see this dalmatian is actually more brown, but is on a black background. So first I opened it up on photoshop, next I created a duplicate image. I simply when to the Enhance menu and selected convert to black and white (making sure I was on the duplicate image). There are a lot of other ways to do it, but I’m all for easy (and there weren’t a lot of fiddly parts to the photograph). Next I simply selected the eraser and used it on the tongue (again making sure I was on the duplicate image) – I made the image bigger and adjusted the size of the brush to keep the lines straight. Have you ever created a black and white with a splash of color design before? If not then why not have a bit of fun and try it on some of your photographs. Author coxylouPosted on November 11, 2018 Tags black & white with a splash of color, black and white, dalmatian greeting card, dog greeting card4 Comments on Dalmatian Greeting Card – Black & White with a Splash of Colour! I love to use images available through Creative Commons to create some of my own designs. You do need to check the license and make sure that they are able to be modified and used without attribution for use on a POD product. I took an image of a bull terrier and added an image of a Santa hat to the dog, popped them both on a bright background and added text. I loved the result, it was also fun trying the different Santa hat images that were available to get just the right one. Another example of this can be found on an older post of mine where I tell you how I created my Catherine Parr Greeting Card. The fun thing about Zazzle is that you can have a number of different stores and do different things in them ie have one based on your own photography, one based on your own artwork, one based on remixed creative commons work, one based on geometric or text based designs, the ideas are endless. Zazzle does well with all kinds of designs, but to be honest a lot of the remixed creative commons designs do outsell a lot of my own art/photography (except for 3 of my bestsellers that is). I think the key to success if finding your own angle and making sure that you do make changes to the design, otherwise you’re competing with thousands of other identical designs because you didn’t create this idea! Zazzle introduced candy tins a few years back with the idea of using them as wedding favors, but I think they’re perfect for the holidays. There’s just something special about Christmas Candy Tins. The tins come in a few different shapes these days, but the inside is still your choice of mint or jelly beans and the idea is great. I think I love the idea because my great uncle used to always carry a little tin of mints around with him and sometimes I’d get to have one! Even these days I usually have some mints in my bag so a little tin is a great idea. These candy tins are made by Zazzle which means that they can be personalized – you can get monogrammed tins, tins with people’s own names on them, photos, the ideas are endless. These little tins are great to add to a gift basket or to pop into a Christmas hamper. They also make fun stocking fillers. If you have a business they are also a great idea to give to your clients. You can add your business name, or just choose a Christmas design and pop your business card in with the gift. The tins can be refillable which is what makes them a really useful gift – I know I’m not the only one who keeps some mints in my purse all the time, or am !? This rectangle-shaped tin (0.70 oz) features rounded edges and a brushed metal or white finish for an elegant look and feel. Filled with fresh mints or your favorite Jelly Belly™ flavor, it’s the perfect gift or party favor that everyone will love to take home. Please Note: They are small tins – check the measurements with a ruler so you know what to expect, having said that they are the perfect size to throw in a purse or pocket. I have seen images where a fellow designer brought a selection popped them inside small organza bags and hung on the Christmas tree as decorations – I think this is a really cool idea. This idea is especially great for a business as you could hang them on the firm’s Christmas tree as decorations and then hand them out to clients as they come into the office – it’s always great to get a gift when visiting your accountant, solicitor, broker etc. Zazzle introduced their foil cards in time for everyone to start designing their Christmas greeting cards on them. There have been some amazing designs showing up already by the talented designers that use the site. I had a White Christmas inspired card design that I had planned to put on a card this year and I thought it would work on the foil card nicely as well. This is the design on a ‘normal’ Christmas card (above) and here is what it turns out like on a silver foil card…. I quite like the foil effect, but I also love the detail that the non-foil card has – which is your favorite? The foil cards are also available in gold foil as well as silver and to be honest it looks like the gold foil is more popular than the silver. Here’s one I created quickly (using an image available in creative commons along with a font found on Zazzle) so that you can see what the effect looks like. Have you made any foil greeting cards yet and do you have a preference between the silver and gold – personally I like them both and think it’s just a case of which one suits the design best. This grey-blue and sand colored Morrocan inspired design is perfect for a student and will suit male or females. With the student in mind I’ve selected a few products from the range which would be perfect. Getting up late and rushing to lectures is a lot easier with a big hit of caffeine to help you funchtion and that is where this travel coffee mug has you covered! If you’re not into travel mugs then this design is also available on both standard and tall mugs, but seriously you need your coffee to go! Now when it comes to student life you do need to cart a few things around with you. My teen daughter favors a tote bag to lug her laptop and girly essentials around. I have, however, seen some of the other students with drawstring bags over their shoulders so I’ve included both styles of bags here for you to peruse. When it comes to taking notes in class these days then your phone or laptop is generally the way to go. Some people still like to go old school with books though. I would use the spiral notebook below to keep track of assignments and homework due as writing it down makes me more likely to remember something. A journal is a great thing to keep while you’re a student because they are quite fun to read again as you get older and can be a treasure trove of memories. Whether you’re a student or not I hope you’ve enjoyed these Morrocan Inspired Designer products. February 14th will be here in less than a month and the sales of red roses will shoot up dramatically and with it the smell of love and romance will fill the air. I must admit I don’t have many Valentine’s Day cards designed as the date just seems to sneak up on me every year! I do have a Gothic Valentine’s Day card which is popular however. There are lots of unique Valentine’s Day cards available to purchase from Zombie Valentine’s to Geeky Valentines and the ever increasing anti-Valentines. I designed this particular Vintage Gothic Valentine’s Day card back in 2011 as I’d had success with a Gothic Christmas card I designed the year before. I would love to tell you how I designed this particular card, but in this case I actually can’t remember. I do know that I had only recently gotten Photoshop at that time and was doing a lot of ‘experimenting’ as I was learning the program. I think the vintage look of the image is quite endearing and the ‘greying out’ of the gentleman (in my mind at least) gives the idea that he is the ghost of her true love and their love is still strong. The whole idea of an eternal love is deeply rooted in the Gothic sub-culture so it works well. 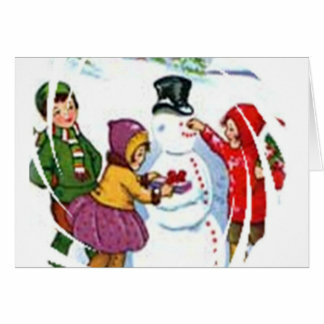 One of the first designs I remember doing using an image from Creative Commons is this vintage winter snowman Christmas card. It shows three gorgeous children building a snowman and I fell in love with the image. Unfortunately as this picture was in the public domain and able to be used by anyone I knew that there was a chance lots of other people would be using this image on various POD companies. I had to think of what I could do to keep the great image and yet make it a little different from anyone else’s image. I created this image a long time ago with an old computer that had the now discontinued Picture It! program on it. I put a filter onto the image which is what gave the image the round, part circles around the outside. As soon as I saw that I fell in love as in my mind it was like looking through a snowball heading towards this happy group. It has been a popular design and makes me nostalgic for Microsoft Picture It! as this is the second time I’ve ‘developed’ a popular design with the program – the other one was my Sydney Harbour Bridge design. Having said that I do love my Photoshop so I’d better not complain too much! Christmas Is Coming – Get All Your Festive Goodies Now! Well it’s nearly December which means the holiday season is well on it’s way to us, so do you have all of your Christmas cards, decorations, gift wrap, fashion and (mustn’t forget) gifts all organized yet? I thought I’d wrap up a few ideas for you to help with your Christmas list this year. First up both Redbubble and Zazzle are great places to look for unique gift ideas and Zazzle in particular has lots of items that can easily be personalized. Let’s look at Christmas cards first, I know that over the last couple of years I’ve received more e-cards or just messages on social media, but there’s something special about sending and receiving actual Christmas cards that’s very special. People first started sending Christmas cards in the Victorian times which means that we’re now in the third millennium that have used Christmas cards – the 1800s, the 1900s and the 2000s – that’s some pretty cool history right there! A great collection of Christmas cards can be found as part of the above Christmas Cards Collection from one of my Zazzle Stores. If you’re looking for themed Christmas cards then check out these other Christmas card collections….. There are lots of other Christmas cards available at The Cool Card Shop. There are so many different Christmas ornaments to choose from that it’s hard to know what theme you want to use to decorate your tree or if, in fact you’d prefer a mishmash of themes. There are lots more themed ornaments for you to choose from including some owl ones I featured on a previous post about Owl Christmas Goodies! Personally I think the Christmas Tree Ideas website has the best selection of themed Christmas ornaments and for other Christmas tree ideas you could check out their facebook page. You can also get some great personalized festive wrapping paper from Zazzle which looks awesome. Of course we’ve also had a post on Dog Christmas Gift Wrap and in case you can’t tell I do have a soft spot for dogs! As I said before Zazzle and Redbubble are great places to look for gift ideas and another place for a unique gift idea is Etsy, although I do have to warn you Etsy makes time disappear! If you’re really stuck on ideas then I do have a couple of cool links for you to check out – great gift ideas for women & great gift ideas for men – you can thank me later for those! If you want to really get in the mood for Christmas then a Christmas outfit is a great idea. Now not everyone should dress up as Santa or an Elf, but there’s no reason why you can’t wear a Christmas T-Shirt or Hoodie. I hope you’ve enjoyed my Christmas roundup and that you are now organized for the holiday season – Merry Christmas from Lous Designs! Author coxylouPosted on November 28, 2016 December 19, 2016 Tags christmas, christmas cards, christmas decor, christmas gift wrap, christmas ornaments, christmas t-shirts, christmas throw pillows4 Comments on Christmas Is Coming – Get All Your Festive Goodies Now! I get woken up (way too early I should add) by a variety of bird calls, but the laughing kookaburra certainly seems the loudest! Luckily I enjoy seeing a kookaburra in my garden so I don’t complain, well not too much anyway! I have quite a few laughing kookaburra images to share and I’ve finally gotten around to creating my first kookaburra greeting card on Zazzle from one of my recent visits from a kookaburra. As you know from earlier posts I do love birds and I have a variety of them residing in the trees around me from Turtle Spotted Doves to Rainbow Lorikeets, Australian Magpies to Kookaburras and many more. The Kookaburra is certainly loud enough to herald his presence, but I don’t catch a glimpse of him as often as the others. He really did seem to want to make sure I got all of his sides, didn’t he? Definitely a model bird in the making! As you can see from his profile our Laughing Kookaburras belong to the kingfisher family. Are you bored of the constant plain black bodycon mini skirts that EVERYONE seems to have? Do something about it and check out some of the cool designer mini skirts available at Redbubble. As a designer I’ve created a few mini skirts and here I’m featuring two of my designs that are influenced by nature. This fun design is based around an agapanthus, a beautiful purple floral graphic. This floral print designer mini skirt adds a pop of purple to your outfit which is one of those colors that is flattering to everyone. If you’re having trouble pulling away from the generic black mini skirt, you should be happy to know this gorgeous design is also available on a couple of different tops. The pattern on these designer mini skirts is repeated on the back as you can see (to a degree) on the side view of the skirts (above and below). The material used is made up of 82% polyester and 18% elastane and as you can see from the images the waistband is one of the popular stretch waistbands. Besides flowers what else can be considered influenced by nature? Butterflies of course! I do love butterflies which is why this next skirt features a black and white butterfly! This design is perfect because there’s no color to it (which seems to be very important with some sections of the population when it comes to fashion!) and yet it’s unique and will make you stand out in the crowd. I hope you’ve enjoyed at least one of these two designer mini skirts that I’ve brought you today. If a skirt isn’t quite your thing then there are some awesome black and white graphic t-shirt dresses or a selection of different t-shirts designed by yours truly which you are welcome to check out.